A little while back 2 good sized boxes in the mail. 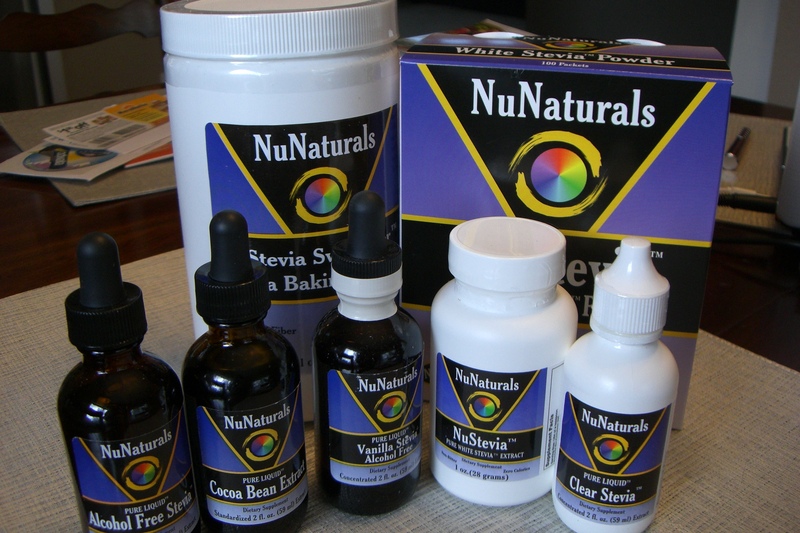 NuNaturals sent a big supply of stevia based sweeteners. Right away I tried the individual packs with my morning tea and found them extremely sweet. I’ve found a balance though. I can use the same pack for 3-4 days. Yes, it is that sweet. The liquid stevia has been great especially in plain yogurt. The cocoa bean extract and vanilla stevia are definately my favorites. They turn plain yogurt into such a treat. You can easily adjust the sweetness by adding more or using less drops. The one product that isn’t really suiting me is the baking blend. I used it in a strawberry rhubarb crisp and it just tasted off. The flavor was just strange. Along with the samples I was sent a TON of recipes to try that use their products. I will have to try one that uses the baking blend to see if the flavor was just off in the crisp or if I’m just not a fan of it in general. Have you tried any of NuNaturals products? What is your favorite recipe that uses stevia? Brother-All-Natural makes fun, easy on-the-go snacks. A friend at work told me about these freeze dried fruits she got for her grandkids easter baskets. What a great idea, why fill the basket with candy when you can give them something tasty and healthy at the same time? Each apple and pear pack are filled with 1 1/2 pieces of fruit. It wouldn’t seen like that because when all the moisture is taken out they really shrink up but taste good! The apple and pear varieties were crispy and kept the natural fruit flavors intact. The strawberry-banana contains 1 banana and 4 strawberries. These were okay… kind of hit or miss. Two out of three packs had extremely sour strawberries in them. They didn’t seem as crispy as the apple and pear packs which is what made them fun to munch on. Jacob was a sampler as well and wants me to buy them at Costco now… at least the apple and pear. They would be great for kids too especially if taking fresh fruit to school wasn’t an easy thing to do. I prefer real fruit over dried or freeze dried but it would be a nice variety to have on hand when you’re out and about or just want something to snack on with a little more crunch. Ever hear of these fruit crisps? 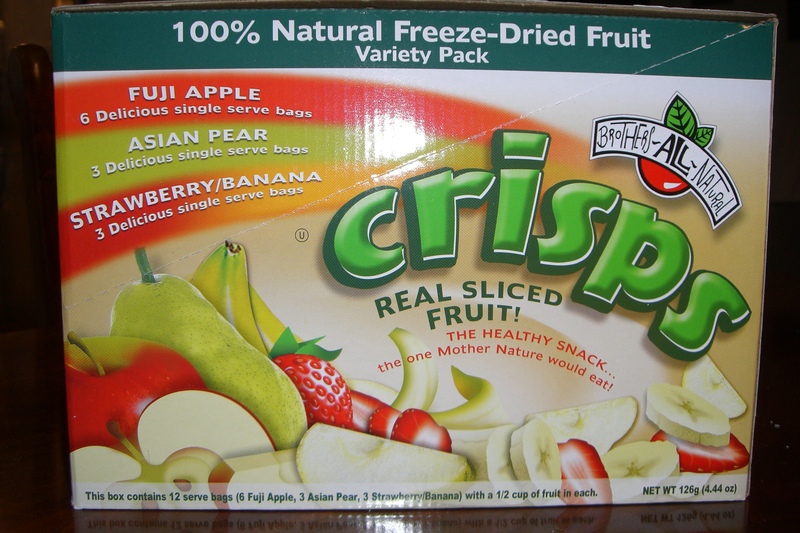 What are your thoughts on freeze dried fruits? i just got that sameee nunaturals pacakge and it ROCKS! I have not tried the NuNaturals yet, but I've read many reviews on the product. I'd definitely like to try it sometime! I am hooked on Truvia currently, it's so smooth and sweet. I have not heard of NuNaturals but have tried Stevia adn don't care for the after taste,made rhubarb sauce last year with it and threw it out .SO I don' t jhave that anymore as I am diabetic and and that sauce needs some serious sweetening. Wondering now about the NuNatural will look fo it in stores here.